Adorable plush Easter basket toy friends will hop right into your heart! Wind 'em up and watch 'em go... They're the cutest addition to Easter baskets and make fun springtime gifts, egg hunt prize box fillers, goodie bag surprises, and whimsical birthday party favors. 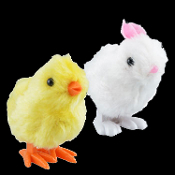 Novelty Hopping Easter Bunny and Chick wind-up toys are covered with cuddly plush faux fur cloth material. Plastic feet and eyes.